It's that time of year again -- the time when a day evaporates in an hour. Spring Break has come and gone. And the race to a school-year finish line is already threatening to hijack life. 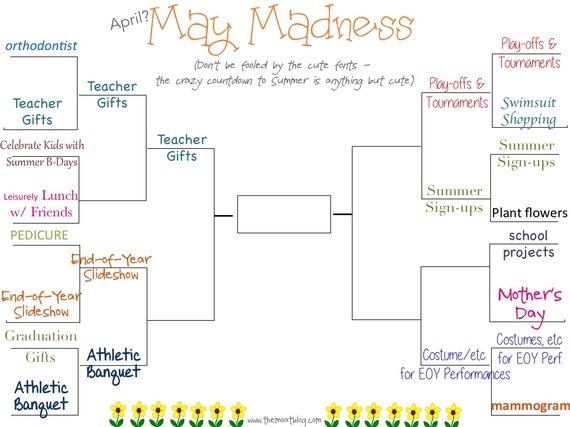 In recognition of all that vies for our attention and in an effort to find sanity in the midst, welcome to the 2nd Annual May Madness Office Pool -- or since we know that our cars are our offices, the 2nd Annual May Madness Car-Pool. With the tournament's first rounds completed (since May has rudely bled into April! ), we're perched at the cusp of the Sweet 16. On the left side of the bracket, Orthodontist is predicted to fall to No.1 Seed, Teacher Gifts. Ortho, normally overlooked and quite often forgotten, was thrilled to make it to the tournament again this year. But highly favored Teacher Gifts is expected to sweep past the easily-rescheduled appointment and even make it to the Final Four. Lunch with Friends looks to likely edge out Celebrate Kids Summer B-days. Poor kids born in June/July/August. Will they ever recover from apparent 2nd-class citizenry and fake Happy Birthday songs? Yes - we know they will. Cupcakes can smooth over most of those not-fair misgivings - especially when there are extras for moms and siblings. Still, with Lunch's "quick-grab" ruled an illegal motion last year - the now Leisurely Lunch with Friends might have a battle on its hands. Pedicure, ever-perched to be put off for another day, is paired with newcomer End-of-Year Slideshows. Take zillions of Instagram/Facebook/Twitter postings, add a few creative moms and welcome yet another achievement-bar: putting all the pics together in ahhhh-inspiring, tear-jerking End-of-the Year Slideshows. Formerly saved for rehearsal dinners or high-school graduations, pic-parades have made their way to first grade (and, really, who doesn't love a montage flash-drive party favor!) Sorry Pedicure, keep the closed-toe shoes within reach, you'll probably have to wait for Summer again. Finishing out the left side of the bracket, Graduation Gifts and Athletic Banquet are back on the court again. It will be no surprise to see Athletic Banquet finish on top. Graduation Gifts just can't shake Procrastination. On the right side of the bracket, Play-Off's and Tourneys bumped last-year's Camp-Shopping from the Sweet 16 Bracket. Kids everywhere will be forced to gather their own clothes and hope for the best. So long cute costumes for camp theme-parties. A white t-shirt, some Sharpee-markers and duck tape will have to suffice. Anything sports-related is heavily favored to make a clean sweep. At the bottom of the bracket, Healthcare providers again breathed a sigh of relief to see Mammogram making the Sweet Sixteen for the 2nd time in history. Yearly Exam fought hard to land a spot, but Disinterest kept blocking their shots. Planting Flowers, though projected to fall to Summer-Sign-Ups, is expected to have a better showing than last year due to a mild winter in the South and hopeful bulb-planting up north. It won't matter, though. Summer-Signups is a sure bet to triumph. Everyone knows boredom is NOT an option. Mother's Day, celebrated at the beginning of May is fighting hard to survive one more round. There's still time. Hopes aren't high, but with a little planning ahead, School Projects just might see its first loss. Fingers are crossed in homes around the world. End of Year Performances and their inherent last minute "Mom -- I need a costume -- TOMORROW!" trumps even the toughest opponents and will likely meet Play-Off's & Tourneys in the Final Four. Seeing the person traveling alongside - trying to catch their breath, not sure where they're supposed to be either. Then walking with them, rather than against. Looking up. Moving the focus away from May Madness toward perspective - some thoughtful consideration that we're human beings, not human doings. Slowing down the race - something that brings with it sanity, even in traffic. Then, try to enjoy every one of May's crazy car-driving/trying-to-get-it-all-done-on-no-sleep minutes because they go TOO FAST -- and maybe sneak in a quick-grab lunch with friends!